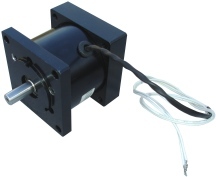 For use with NEMA 34 size servo and stepper motors. Description of operation: Brake is spring applied when no voltage is supplied to the unit. When current is supplied, the braking action is released. This model has 1/2" shaft and 1/2" bore. See note below about bushing that can adapt this brake for use with motor that has 3/8" shaft. We have another NEMA 34 brake that has 3/8" shaft/bore. For information on that product, click here. For technical PDF information on this product, click here. Note: Standard brake unit is designed for motor shaft measuring 1/2". If your motor has 3/8" shaft, please select option below for bushing adapter.